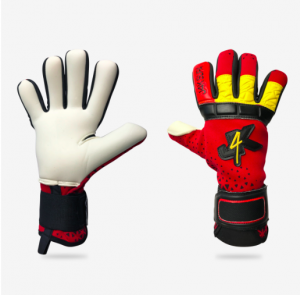 Goalkeeper Gloves Guide – How to Choose the Right Fit? One of the biggest mistake young goalkeepers make (even the most experienced of goalkeepers) is they type into a search engine ‘goalkeeper gloves’ when looking to purchase their next pair of goalkeeper gloves. The problem with just typing this keyword into a search engine, the strong chances are the gk is not going to get the goalkeeper gloves that they actually wanted. However the people who sadly make this schoolboy error mistake, is the parents of a goalkeepers. Or a coach buying a goalkeeping glove for their club keeper. Most parents who have a child playing in goal, do not really understand what to look for their goalkeeping child, so the naively will just type goalkeeper gloves in google for example and the strong chances are the will purchase the wrong gk glove. So why is typing goalkeeper gloves into a search engine potentially a huge mistake to make? This is because the goalkeeper glove companies or the websites selling the gloves, know how to market correctly online, so they will get on the first page of google for the keyword goalkeeper gloves. So this company might have the best marketing strategy to get onto first page of google and maybe the best goalkeeping glove selling website, but this does not necessary mean they will have the correct goalkeeper glove for YOU!. You see when you are picking a keeper glove, you must make sure this glove is the correct shaped glove for your hand. This is so important, I am going to repeat myself, ‘when you are picking a keeper glove, you must make sure this glove is the correct shaped glove for your hand.’ This is so so important! What happens to most goalkeepers (or parents of a goalkeeper) is instead of getting the correct glove for their shaped hand, they will buy a goalie glove that these websites will recommend to them because like I stated above, these websites are good marketers. The goalkeeper glove that has just been launched onto the market. So these websites and companies are promoting a glove for THEIR benefit NOT for the goalkeeper (or parent) looking to buy. Like I said above, the most important thing you have to do when buying goalkeeper gloves is make certain the glove is the correct shape for your hand. I would go as far to say, picking the correct keeper glove that is your hand shape, is more important than picking the best specification gk glove that is the wrong shape for your hand. Ok so how do you pick the correct goalkeeper glove? The Roll Finger goalkeeper Glove is probably the most popular glove palm for professional goalkeepers around the world and this type of palm is suitable for goalkeepers with thin, slender hands or fingers. Negative Cut goalkeeper gloves are generally suitable for goalkeepers with broad hands and or fingers. 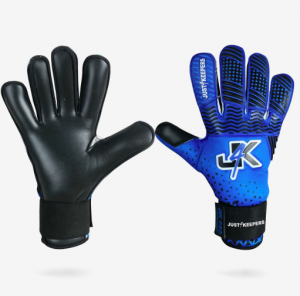 J4K Pro Elite – Fusion Pro Gel Grip – Designed For Total Performance. This glove is ideal for goalkeeper training, semi professional and professional level. 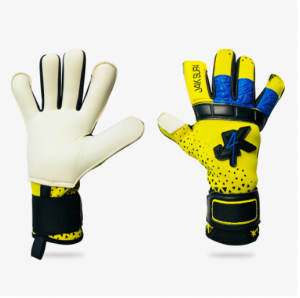 This glove is also ideal for goalkeepers with thin or slim hands. Backhand – German Latex For An All Round Super Soft Feel. 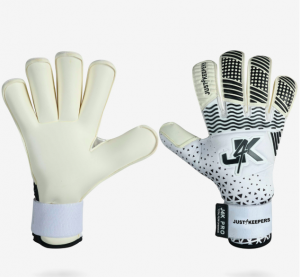 IMPORTANT: ALL J4K gloves have been tried and tested by ex and current professional goalkeepers to maintain our hjgh standards. Flat palms goalkeeper gloves, like Negative Cut goalkeeper gloves are generally suitable for goalkeepers with broad hands and or fingers. Hybrid Cut is a goalkeeper glove normally when the little finger and index finger of the glove is a Roll Finger and the middle two fingers are Negative Cut or Flat Palm. This is normally for keepers who have irregular shaped hands or fingers. Now the above goalkeeping advice is just a rule of thumb, and too be honest the only way you will ever know what goalkeeper glove shape is right for your hand, is to try them on. So you might have to try on different goalkeeper gloves as your goalkeeping career progresses and as you get more experienced, you will know when a goalkeeper glove is the correct shape because you will not even think you are wearing a goalkeeper glovebecause it will fit that snug. Important: When you try on a pair of keeper goalkeeping gloves on, you must feel 200% confident in how they feel on you, if you have any doubt that they do not fit right, or feel uncomfortable DO NOT buy because this glove palm shape is not suitable for your hand. So when picking a goalkeeper glove try and pick a glove that feels natural and comfortable when it’s on your hand. But more importantly don’t just type in goalkeeper glove blindly into a search engine because the chances are you will end up purchasing the wrong goalkeeper glove for your shaped hand.